This finding provides important insights on the growth of supermassive black holes over cosmic time. In other words, they have no clue. The committed merger maniac convinces himself that somehow he is closer to a general understanding. But where does all that gas come from, he fails to ask! Why?? Because the answer is just too inconvenient. From the core star itself. And the observational evidence for your claim can be found where? .......unless you can cough up a pic of a BH, it's not refutable, but you being an asstrophysicist would be prone to making such a psychobabble statement. You exempt yourself from producing "observational evidence" while making demands others produce it. You do this because you too have no evidence that Schwarzschild Black Hole Math theories have any basis within the laws physics of Special or General Relativity where Einstein Field Equations prove Infinite Gravity cannot exist on the surface of any body of mass anywhere in the Universe, yet you believe such laughable fiction even as Hawking refutes it as well. So tell us, why do you think you're smarter than Einstein or Hawking? Have you ever been asked to do a car commercial? What are you talking about? Of course I do not exempt my self from producing observational evidence to support my claims. But I have so far made no claims that require evidence! I simply asked for Tuxford's evidence for the claims made in THEIR post. Are we reading the same thread? P.S. Your constant mocking (and often irrelevant) comments about not being able to produce pictures of black holes only go to emphasize your lack of understanding of the physics under discussion. Pictures are not the only form of evidence you know! ...Hmmmm....so you are going to explain how to interpret the other forms of evidence "correctly" then? NAH...I won't speak for Benni, but I'll pass. In order to make the claims theoretical astrophysics does, you have to completely ignore too many observations and actual physics. I do not need to explain how to interpret the "other forms" of evidence, that is done in the papers that report them. Your refusal to engage with, and understand, those explanations is what leaves you with the mistaken impression that astrophysicists "have to completely ignore too many observations and actual physics". This is obvious to anyone with only the most basic understanding of how to the observations are interpreted. You fool nobody with your claims. If you ever "studied" these things, you have certainly never understood them. If you had you would be able to JUSTIFY your claims instead of trying to convince us simply by incessant repetition. Then you go on to list a set of garbled claims, without any kind of support, and that have nothing to do with the discussion we were having. The truth is that, despite your boastful claims, you have no idea of science or how to conduct a meaningful scientific discourse. Then, to add insult to injury, you post it TWICE!!! No it has not! Give references if you think you know better. 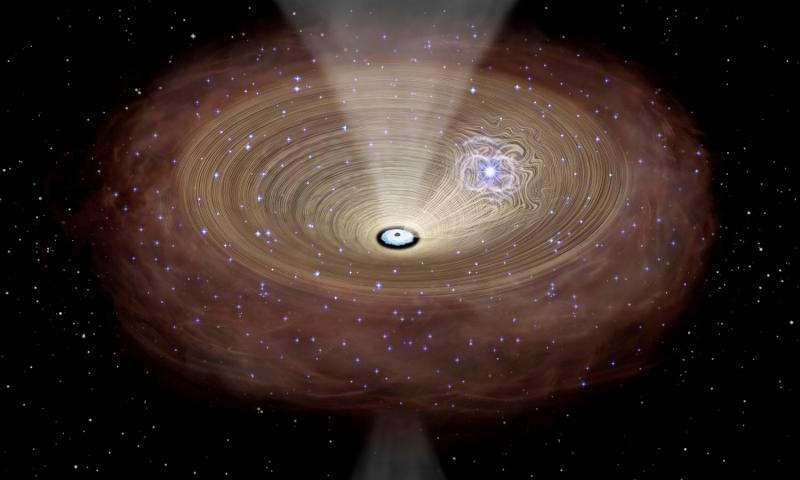 ...we have imaged a completely black circle surrounded by a star field, the mechanism for faster than light expansion has been discovered and how a hole in the sun leads deeper to a cooler region has been explained in the current context of solar model? This is again garbled nonsense. If you want to make a scientific point, learn to use scientific language. Then, finally, you add the use of obscenity to your repertoire of tactics. Not very scientific, is it? As usual, your posts are all obfuscation and abuse, no actual scientific input. OK! So, Then let us start a REAL scientific discourse. Choose ONE example of where you think modern astrophysics is so wrong, and support your claim. I will then supply a response with the appropriate support. What "faster than light expansion" are you referring to? The only one associated with astrophysics, you know of more than one? I know of more than one misconception. So again, to which you are referring? OH! So you are talking about INFLATION. Why didn't you just say so? Firstly: Inflation is certainly the consensus view, but nobody is claiming that it is proven. You fail to understand big bang theory. It says that the universe did not inflate/expand into anything, it CREATED everything. There is NECESSARILY no boundary. I can see how you were confused, sorry. GR doesn't contain a mechanism by which inflation is possible. Einstein didn't support the BB theory, why link it (relativity) for this discussion? - Whether Einstein supported BB theory or not is irrelevant. - GR ALLOWS inflation. Again, I accept it is unproven. Remember to supply support for your counter-claim. OK, now COPY the section you "cited" so we can read for ourselves that the section of GR you have "cited" actually exists within the pages of the document. Right, you should do that. Don't just "cite" GR for what you claim to be a relevant section of GR for the claim you make, but actually Copy & Paste it right here so we know exactly what you're referring to when you claim to have "cited" it from GR. You have never once followed up to any challenge I've put to you to COPY any claims you have ever made for supposedly citing SR or GR, instead you cop out by saying this chatroom is not the right format for such a presentation, yet I have never had a problem with doing so, then after I have made such a post you just go silent, still & dumb like any good asstrophysicist. Nonsense! The "Schwarzschild Black Hole Math" was based on the theory of General Relativity. Einstein Field Equations prove Infinite Gravity cannot exist on the surface of any body of mass anywhere in the Universe, yet you believe such laughable fiction even as Hawking refutes it as well. What on earth do you mean? I AGREE, "Infinite Gravity" does not exist in any desciption of astrophysical obejcts. Nobody is claiming that it does (except you, perhaps). Read it for yourself!. You can not understand it by simply reading one "section". PLUS, it is not my job to educate you in the basics. OK. If you really want to engage in a real scientific discourse, remind me of just one of these "challenges" that I have "failed to follow up on", and your evidence for that view, and let US start a REAL discussion. Schwarzschild did not claim infinite gravity anymore than Newton did. .....and your favorite source for pseudoscience I quoted below. "At the center of a black hole as described by general relativity, lies a gravitational singularity, a region where the spacetime curvature becomes infinite. It can also be shown that the singular region contains all the mass of the black hole solution. The singular region can be thought of as having infinite density. Observers falling into a Schwarzschild black hole cannot avoid being carried into the singularity, once they cross the event horizon. When they reach the singularity, they are crushed to infinity." Read it for yourself!.You can not understand it by simply reading one "section"
......I see, it's another one of those asstrophysics arguments that "it's hidden in between the lines" kind of deal. This is the problem with you pseudoscience asstrophysics acolytes, anytime you're challenged for a "quote" to specific laws of physics you go on a convoluted binge using circular arguments like this. The fact of the matter is, you never "quote", you always use the term "cite" as a diversion to avoid Copy & Pasting a "quote" from the actual document to which you make reference, in this case General Relativity. Above, I quoted directly from WkiPedia the classic definition of a BH, but you can't do that from General Relativity because it doesn't exist in spite of the "cite" by you & WikiPedia to GR. "Spacetime singularities should have "infinite gravity" and are assumed to exist somewhere inside black holes but… they are not things we can observe or reliably compute. Henceforth I assume we do not speak about singularities, only of observable space up to the hole's event horizon. "Then, depends on a quantitative approach to "strength of the gravity". If we estimate the gravity potential, then yes, we can think of it as of infinite. Namely, falling objects experience unlimited redshift, time dilation in the stationary reference frame also becomes infinite at the event horizon, and we need very much energy to pull a fixed-mass particle (such as electron or proton) out of the hole from the vicinity of the horizon; eventually infinite amount when we want to pull something from the horizon itself..."
-Multiple refs come up for infinite gravity. .........and remember when RNP was coming on here as Da Schneib claiming to have pics of BHs? That was a hoot wasn't it? So Rguy, do you have schneibo's pics of BHs? It would be fun to see how badly smeared they are with all the PhotoShop air brushing. GRT predicts these should collapse into BHs although the collapsing mass will never cross an event horizon as observed from outside. ...........oh, really? OK, Copy & Paste that part of the text of General Relativity so we can all share in your newfound joy............or maybe you'd just like to pull an RNP & do the usual "cite" routine? Absolutely any text on GRT, is that a good reference for you ?